Do you have a tree stump that you are tired of mowing around and is just an eyesore to the rest of your yard? If so, Call Destiny Tree Care. 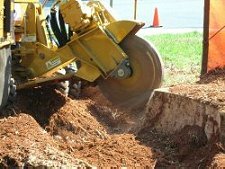 We can remove tree stumps by grinding them down below the surface of the soil. 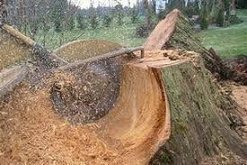 We are a family-owned tree service company located in the Sacramento area who offers professional stump removal services throughout the area including the cities of Auburn, Carmichael, Citrus Heights, Colfax, Granite Bay, El Dorado Hills, Folsom, Lincoln, Loomis, Roseville, Rocklin, Rancho Cordova and Sacramento. We can remove your stump when we cut down the tree, or you can call us later for stump removal. With our top of the line stump grinding machines, we can grind any unsightly stump from anywhere on your property. We will even leave the tree stump wood chips piled up for you to re-use as mulch. Upon consultation, let us know what your plans are for the area and he can give you your best options. For example, if you intend to re-plant, such as flowers, shrubs, bushes or another tree, then the tree stump roots will need to be completely removed. We will perform all tree stump removal / grinding services in a timely manner, and will have your landscape clean and stump free in about a day, depending on the tree size and the amount of stumps in a yard. At Destiny Tree Care, we are the Sacramento are tree service experts. We provide a comprehensive range of tree services designed to promote the health and beauty of your trees. Our professionals have the skill, tools and experience to safely and effectively remove any tree stump, preparing your yard for a fresh new look. In addition, because your satisfaction is our foremost goal, you can expect friendly, attentive service and great results. Need to remove an unsightly tree stump from your yard? Destiny Tree Care is just a phone call away to take care of the healthy, beautiful trees you love.